From an NYT article on having bartenders at your party, even in tiny little flats. In my opinion, if you don’t have a bartender at your party, you’re a loser, said Dustin Terry, who lives a floor below Ms. Argiro and said his job was to get models and Saudi royalty into hot clubs. The bartender brings class and sophistication. Ugh. What a bunch of pretentious twats. That said, credit to the bartenders for putting up with them and taking their money. Picked this map up a few months ago at a used bookstore, but kept forgetting to actually scan the thing. It’s pretty funky, with a weird perspective that you don’t usually see these days. 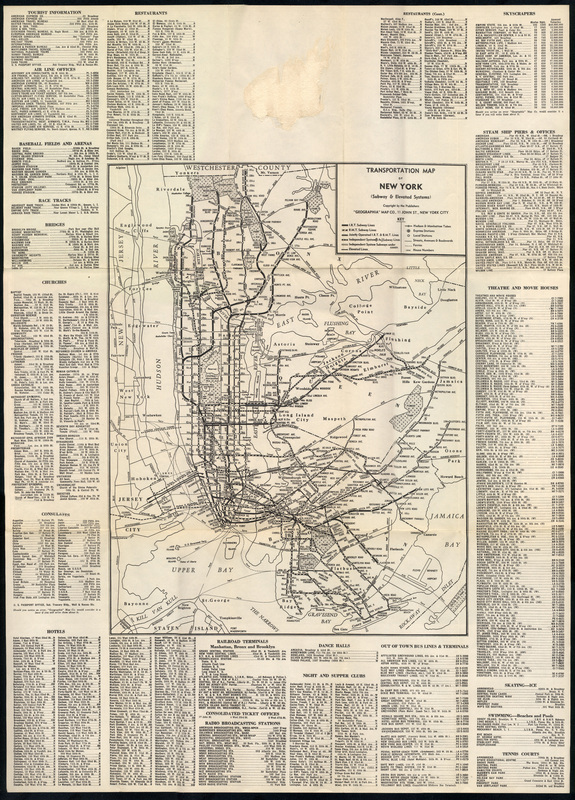 The map has no date, but sometime around 1950 would be a decent estimate. There’s a transit map on the back, but it needs some more work before it gets posted. We’ll save that project for a rainy day, I’ve already put far too much effort into stitching this one together. 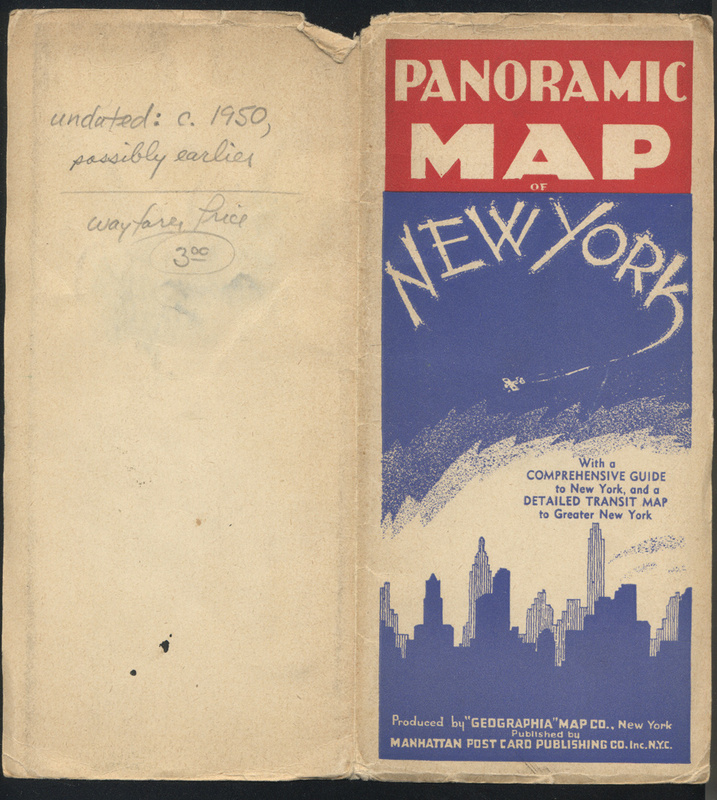 Comments also indicate that the map is likely from around the time of the 1939 World’s Fair. I’ve also added a copy of the transportation map on the back. Had scanned it in but forgot to stitch the images together. From Jim Hughes at Codex 99. 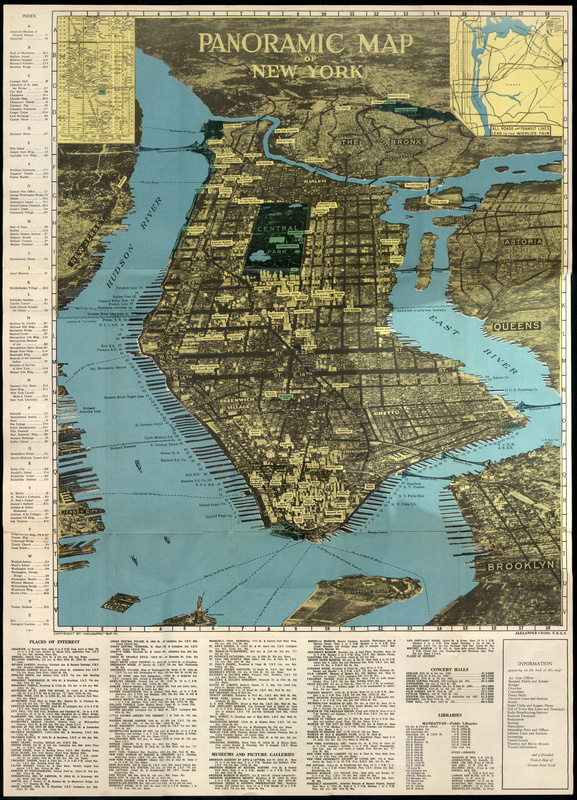 Although the traditional maps were becoming more accurate, the ever-increasing height and sheer density of buildings made perspective mapping increasingly problematic. This map, prepared as a 1939 World’s Fair souvenir by Alexander Gross shows the limitations of traditional perspective.